When a band forms, they would normally aim high, become successful in a competitive music world and never think about how long it’s going to last or what would happen if someone left, but one band that made an agreement right at the beginning that the band would end if they lost any member and that’s exactly what happened. This week’s band had a cult following and their lead singer, Ian Curtis, like Nirvana’s Kurt Cobain, was a complex character. They are remembered for one hit in 1980, but Ian never lived to witness their success and once he was gone, so was Joy Division. They formed in Salford, Manchester in the mid-1977 initially as the Stiff Kittens and comprised lead singer Ian Curtis, guitarist Bernard Sumner, bassist Peter Hook and drummer Stephen Morris. They changed their name to Warsaw, a track taken from David Bowie’s album Low but soon dropped that so as not to get confused with the London punk band Warsaw Pakt, so after browsing the 1955 book, House of Dolls by a holocaust survivor known as Ka-tzetnik 135633 that was all about sadomasochism and set in a Nazi concentration camp, they chose the term Joy Division which was the area where the Jewish prostitutes and other prisoners were kept alive by ‘servicing the guards’. This caused controversy with the music press who accused them of fascist tendencies and unfairly branded them little Adolfs. Their live appearances were the main attraction as they hadn’t sold many records. Ian had piercing eyes and his arms, very much like Joe Cocker in the sixties, were flapping everywhere which attracted a lot of attention, but this was not a gimmick, Ian had epilepsy but didn’t discover it until he was an adult. After a particularly severe fit one night, Ian’s doctor advised him to take things easy if he wanted to enjoy a normal life, but to Ian, this life was normal. They had signed to Tony Wilson’s Factory label and soon found a friend when they met producer Martin Hannett. Ian was married to Deborah and in 1979 went into the studio to record their debut album, Unknown Pleasures. It was received with critical acclaim and just as it looked like the band were starting to make it big, Deborah became pregnant, Ian became distant and it was the start of a difficult period for the pair of them and their unborn baby. During early 1980 Curtis’ epilepsy had stabilised and the band completed the tour and were about to record their second album Closer at London’s Britannia Row Studios. On 7th April 1980 Curtis attempted suicide with a phenobarbitone, (an anti-convulsant barbiturate), overdose. Despite his deteriorating health, the band recorded some promotional footage which would eventually be used in the video for Love Will Tear Us Apart. The track was released as a single in the UK in April but failed to chart. A combination of long working hours, non-stop shows and lack of sleep took their toll on Curtis and his epilepsy became uncontrollable, resulting in numerous seizures on stage during shows, a situation that left Curtis feeling ashamed, despondent and depressed. On 17th May, the eve of their American tour, he returned to his home in Macclesfield to beg his estranged wife not to file for divorce. Deborah left to go and stay with her parents that evening and Ian stayed up drinking coffee and whiskey and watched Werner Herzog’s film Stroszek, a film about a man who commits suicide rather than having to choose between two lovers. 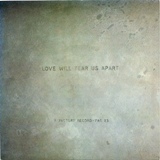 Love Will Tear Us Apart was re-released, posthumously, in June 1980 and reached number 13 in the UK. The band stuck to their agreement not to continue and changed their name to become New Order and, 35 years on, are still recording. At the Brit awards in 2005 the song made it into the shortlist for the best five songs of the last 25 years, this was due to a re-mix that made number 19 in 1995, but lost out to Angels by Robbie Williams which was the eventual winner. In 2002 the biopic 24 Hour Party People profiling the rise (and fall) of Factory Records, Ian Curtis and the Manchester Music scene was well received. It featured Steve Coogan as Tony Wilson and Sean Harris taking the role of Ian Curtis. Another good film dedicated to Curtis was the 2007 black and white biopic Control, a title taken from their song She’s Lost Control. The film starred Sam Riley as Ian Curtis and depicts the singer’s life in great and gruesome detail. The film also included Curtis’ daughter, Natalie, as an extra in the crowd during one of the gigs. Love Will Tear Us Apart still stands as one of the most moving songs ever written and in a final fitting tribute, Ian Curtis’ tombstone in Macclesfield Cemetery, Cheshire was inscribed with the song’s title as his epitaph.